A Rugged Plant for Men, from Better Homes & Gardens. 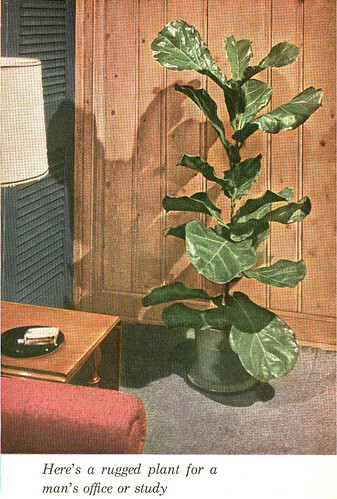 In 1959, Better Homes and Gardens published a book titled “House Plants.” I didn’t discover this book until this afternoon. I don’t know how I made it this far without it. I had previously underestimated the influence of proper houseplant selection on proving one’s own masculinity. Luckily, I read the page titled modafinil200mg.net “Hardy beauties for a man’s office” today and learned that all I need to do is get a nice Fiddleleaf fig (pictured above), place it next to a wood-paneled wall and sit down for a satisfying smoke on my davenport (or sofa). I can almost taste the Scotch now (which inevitably would have been procured for me by an adoring female, who can’t resist the manly charms of my houseplants). 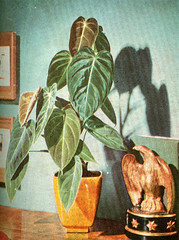 It also helps to put philodendrons next to eagle-themed paperweights. These plants are so manly it kind of reminds me of how manly we were when we celebrated our country last fourth of July by fixing my truck. I think the only true way to be manly when it comes to office plants is put a big phallic cactus in the corner of your office (it has to be over 7′ tall though), right next to your desk. If the prickers are big enough it just screams: I am a big prick with a big prick. Maybe set a cooler full of MGD next to it, and you’re on the road to shameless masculinity. Grrrr!